Please welcome Kari from Cooking With Toddlers. She's here to share a recipe that's easy to make with your little ones at home. Thanks so much, Kari! 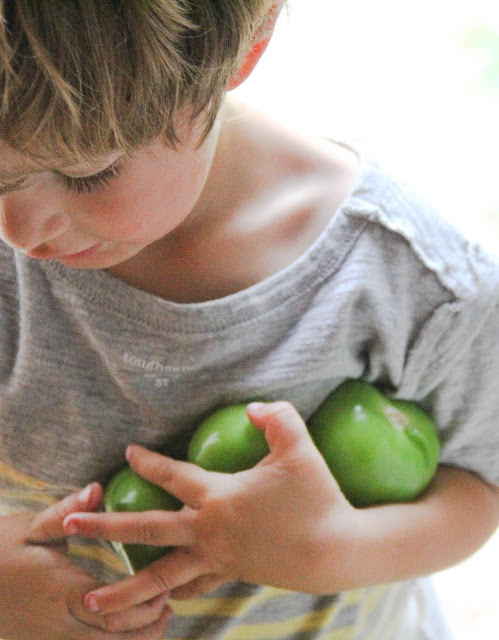 Husking tomatillos are irresistible to young ones. 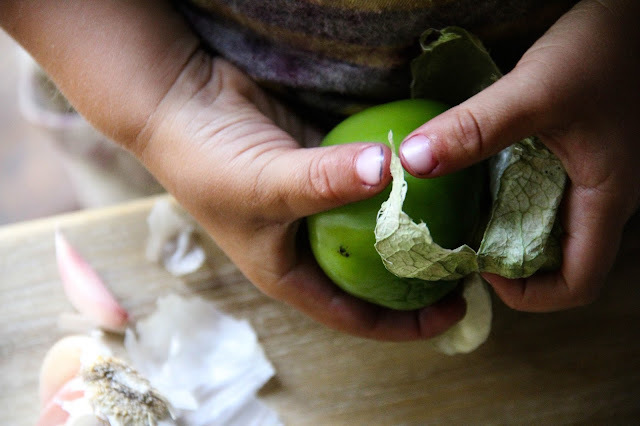 The papery cocoon that houses the sticky tomatillo is magical and something that must be investigated my three year old will tell you. 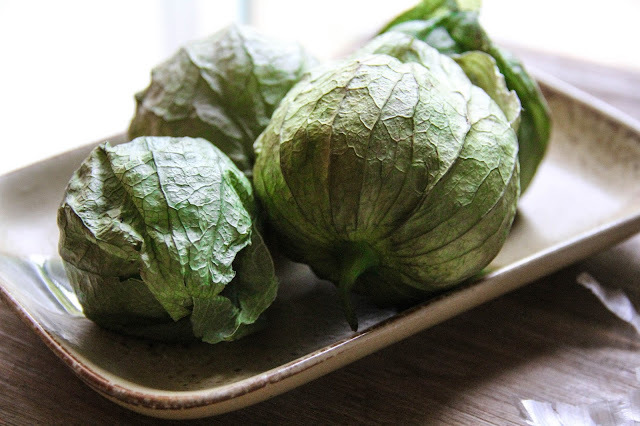 Our bald tomatillo plants will concur since nearly all the plants in our garden lay bare, their protective husks missing. In a moment of maternal busyness, I noticed my little one systematically removing all the tomatillo husks only before it was too late. 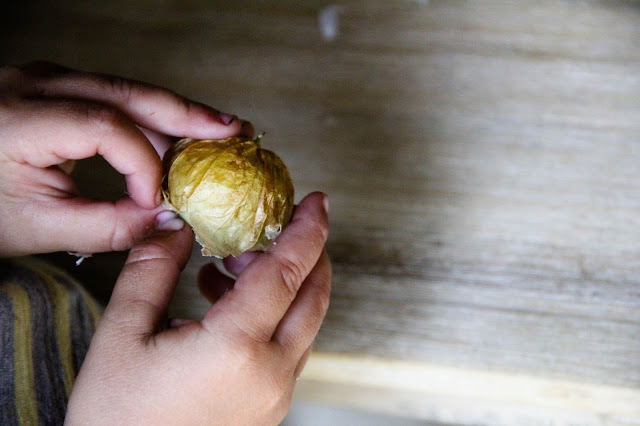 Since clearly tomatillos were of interest to my budding gardener and chef, we took it upon ourselves to channel his curiosity in a productive way. 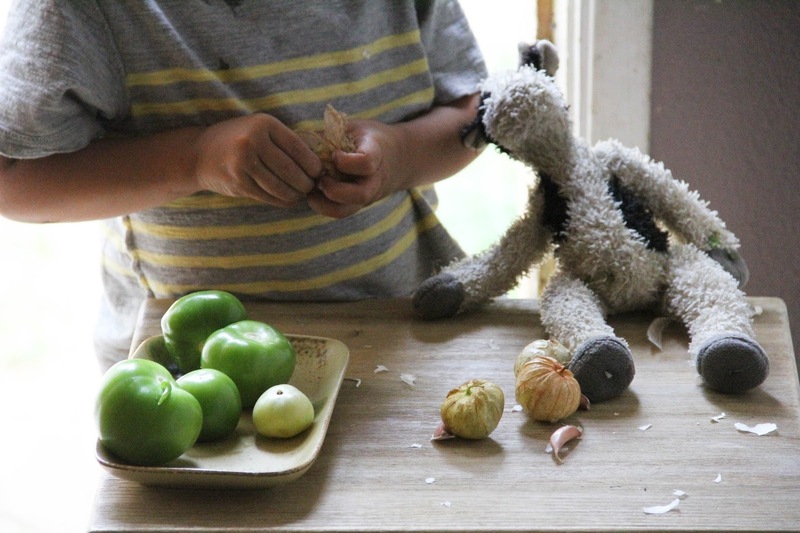 Roasted tomatillo salsa was decided upon and my little one was overjoyed to learn that he would be husking a pound and a half of salvaged garden tomatillos. 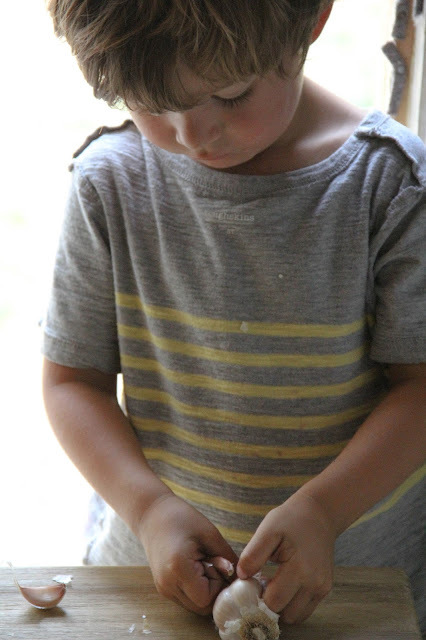 Working with these enchanted little fruits is an activity that will keep children occupied and fascinated for a good long while; a perfect way to spend a balmy summer afternoon. Broil the tomatillos and garlic until all sides are charred. You will need to turn the garlic and tomatillos every few minutes until evenly charred (about 5-7 minutes). Blend the remaining ingredients with the broiled tomatillos and garlic until smooth. Kari writes at www.cookingwithtoddlers.org, a site dedicated to eating and preparing plant based foods with little ones. She has two boys three and under. Follow her on Instagram, Twitter, and Pinterest.